At the start of the week, I had 12 weeks to go until the Blenheim Sprint Triathlon and it was time to find myself a plan. Having searched around, I found a 12 week intermediate plan – clearly being a little over-optimistic about my abilities. The plan includes 2 swims, 2 runs and 2 cycle sessions and I’ll adapt it to fit in with life as best I can. Given that I typically do 2 or 3 swim sessions with Southampton Tri Club and 2 or 3 runs, it’s really a case of fitting in some cycle sessions. Tuesday – started the day with Run Camp. The session consisted of 12 x 30 second efforts with 1 minute recovery. Harsh but fun! We also had some S&C to do. Great session as always. Wednesday – the warmth of my bed almost meant not making it to the early morning STC swim session but, as always, I’m had I did. Although I managed to not start my Garmin until 300m into the session, we covered over 2 miles in total. My furthest ever swim I believe and none to shabby in terms of some of the lengths. Slowly getting quicker and reducing the number of strokes per length. Thursday – the first session of the week where I followed the training plan with a 10 minute warm up and then some hill intervals followed by a 15 minute effort and 5 minute cool down. I enjoyed it. Saturday – my 45th birthday and my opportunity for a lie in. Unfortunately, Daniel and Connor had other plans and woke me up with a rousing verse of Happy Birthday. Lie in over. I decided that as I was racing on Sunday that I’d swim so headed to the Quays for the 3rd STC swim session of the week. It was a session led by Kathy which meant pace work. We started with a 100m warmup followed by some side kicking, single arm and kicking drills. The main set was 3 lots of 8 x 50 front crawl followed by 50m kick drill. Harsh but good. I managed some decent laps with 11 strokes and sub-28 minute for 25m. That gave Garmin SWOLF score of 38! That feels good! Trying to avoid cake and other bad food for the rest of my birthday was a challenge but I managed it. Just!! 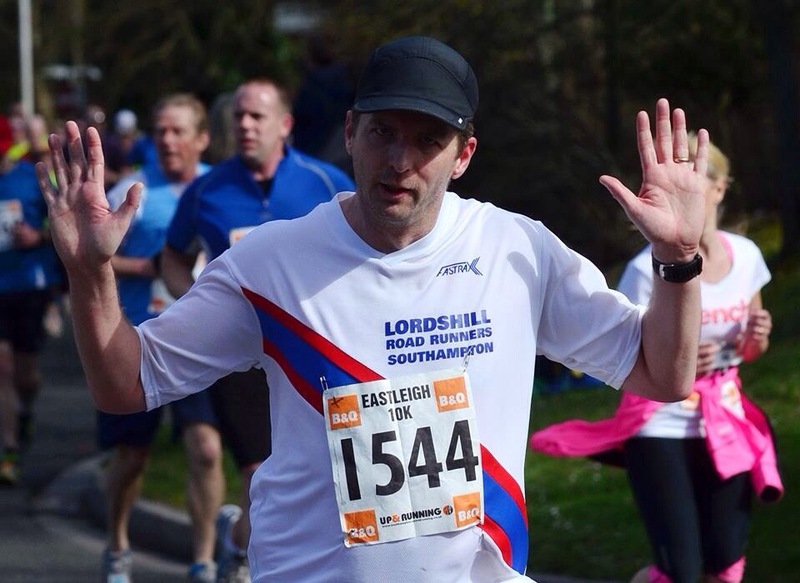 Sunday – the day of the Eastleigh 10K. I’ve run this race now for several years now and my PB is 49:49. Last year, I got close to this with 50:03 and I hoped to do the same this year. However, a less than perfect year to date in terms of training, weight and several other excuses I’m sure I can make up and sound convincing meant a PB was unlikely. In fact, a DNS was almost on the cards as work issues threatened to derail the day before it had even begun. Fortunately, I managed to resolve the issues and headed for Fleming Park and got a parking space by 8:30am. I quickly headed for the sports hall to collect my race T-shirt, chatted with several people I knew and then went back to the car half-expecting to have to head home. Luckily, that wasn’t necessary. At 9:20am, I went to the meeting point for our club as we were having the usual club photo taken. Having spoken to quite a few club members, it was time to head for the start area where I joined the queue. I spoke with Karen Bolton who I guessed would finish in a similar time to myself and waited for the gun. The firing of the gun surprised many and the masses shuffled forward to the chip timing mats before easing over them to start the race. I soon caught up with Teri and Tamsyn and eased past them. As both were in the final stages of marathon training, I wasn’t overly surprised to overtake them even though they are a similar pace to me. Having positioned myself on the right side of the pack to get my photo taken by Paul (Hammy) Hammond, I try to maintain a pace of about 5 mins per km. This worked for the first couple of km until the course’s one and only real incline. It always saps my energy. I had overtaken Irene a short time before as well as Mike who I tend to have a race against at most events we’re both at. As the course levelled out, I struggled to gain momentum to speed up and this continued on the gradual descent. Between 4-6km, it was clear a PB was out of the question. At this point, I was losing ground to many as they overtook me. Ali was looking strong as she went by and wished me a happy birthday. Teri was also looking comfortable as she eased past. The stretch between 6-8km is always a mental battle, one which fellow Run Camper, Katherine, won as she went past me. Mike also eased by and I was determined to not let him get too far ahead. I kept on his ‘tail’ until the 9km mark and then as we hit the 800m mark, eased by. We were neck and neck and I suggested we race to the finish. Mike declined and to the shouts of encouragement from several people I knew on the finish straight, I ramped my pace up to finish in 53:12. 3 minutes and 23 seconds slower than my PB. I had lost this time from the 3km mark as my pace had dropped by about 25 seconds per km. I could have been disappointed with my performance but knew I’d done my best. I probably wasn’t giving it 110% but wanted to finish more than PB and that I did. Having grabbed a slice of cake and spoken to the Boshiers (Ian had PB’d dramatically), I picked up my bag, chatted to several friends (most of whom had PB’d) before heading home to pick the boys up for the Fun Run. After I’d showered, I looked out to see the rain had started. 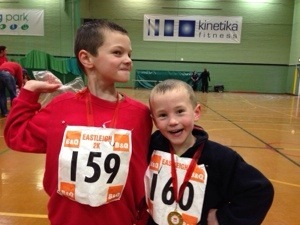 Neither Daniel or Connor were keen to run in the downpour so we decided to give it a miss. However, at 12:10, the sun was back out so with some verbal encouragement we left the house. Denise, who was originally going to run with Connor, decided to stay at home. We got to the start area with a few minutes spare, spoke to Laura and Clare and then got the boy’s race numbers on before lining up. I chatted with Winchester parkrun EDs, Tansy and Dave whose daughters were running and then we were off. The course was different to last year’s and included the hill is decided against using in the original Eastleigh parkrun course on the Old Golf Course. Cruel! 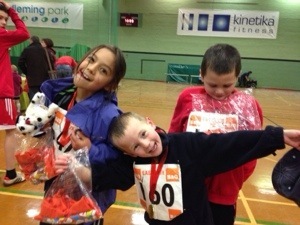 We ran/walked the whole 1.35km of the 2km course :-S and then lined up for ages waiting to collect the boy’s gold medals. The ribbons were all tangled up and needed cutting to free themselves. Something to work on for next year I think!! Having collected the race T-shirts from the main hall (tech T-shirts no less – a damn sight better than the cotton cr@p the 10K runners get), we had time to quickly catch up with Deepak and Anisha for a photo opportunity before we headed home.